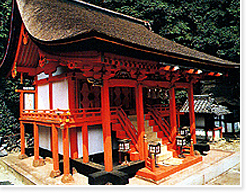 When Yahatano-kami (Hachiman God) was invited from Ohita Prefecture to be the guardian deity for Todaiji temple’s Great Buddha in 749 AD, Yahatano-kami stayed here before arriving at Todaiji Temple. The main shrine is designated as an important cultural property of the nation because the building was built during Muromachi period (1392-1573 AD) and it holds the feature of the late Muromachi period construction. Bound for Hoji and get off at "Takayama Hachimangu Mae" stop.